Argentina and China are aiming to close a deal within days for the construction of the South American nation’s fourth nuclear power plant, a multi-billion dollar project that would cement Beijing’s deepening influence in a key regional U.S. ally. A building with The Industrial and Commercial Bank of China Ltd (ICBC) logo is seen in Buenos Aires, Argentina November 26, 2018. Picture taken November 26, 2018. REUTERS/Marcos Brindicci. Argentina hopes to announce an agreement on the Chinese-financed construction of the Atucha III nuclear power plant during Chinese President Xi Jinping’s state visit on Sunday following the summit of leaders of G20 industrialized nations in Buenos Aires, Juan Pablo Tripodi, head of Argentina’s national investment agency, told Reuters in an interview. The potential deal, reportedly worth up to $8 billion, is emblematic of China’s strengthening of economic, diplomatic and cultural ties with Argentina. It is part of a wider push by Beijing into Latin America that has alarmed the United States, which views the region as its backyard and is suspicious of China’s motives. The focus of this week’s meeting between U.S. President Donald Trump and his Chinese counterpart Xi Jinping on the sidelines of G20 will be on their two countries’ trade war, but the backdrop will be the competition between the powers for influence in Latin America. When Argentina negotiated a $56.3 billion financing deal with the International Monetary Fund (IMF) to rescue its troubled economy earlier this year, Trump voiced his support for the plan and President Mauricio Macri’s leadership. But it is China that has emerged as Argentina’s critical trading partner, investor and financier, a Reuters review of trade and investment data shows, with Beijing pumping billions into Argentina’s economy and positioning itself as a reliable lender for its crisis-stricken economy. China and Argentina are expected to seal a currency swap deal this weekend that doubles the original amount of the credit line to $18.7 billion. The deal will make China the biggest non-institutional lender to Argentina. China is the main importer of Argentine soybeans, the South American country’s biggest cash crop. In the last 10 years, it has also emerged as a major financier of Argentine projects, mainly infrastructure, worth a total of about $18 billion, offering low interest rates of between 3 and 4 percent, according to a Reuters review of Chinese state funding data compiled by the Inter-American Dialogue, a Washington-based non-profit think-tank. The negotiations on Chinese financing of the Atucha III nuclear power plant are a key cause for concern for the U.S. government, a senior Trump administration official told Reuters. 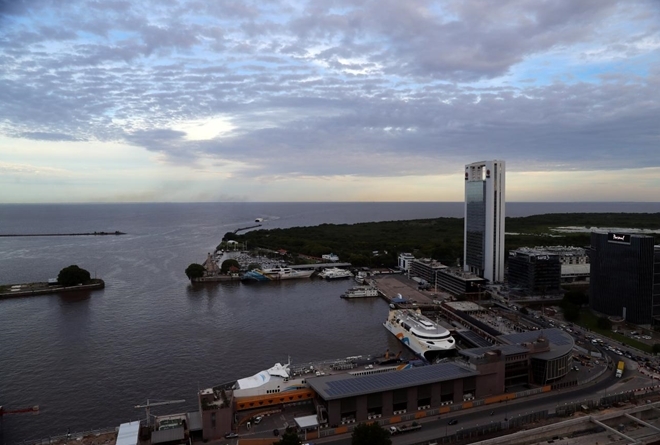 Atucha III would be one of the biggest projects financed by China in Argentina, according to the Reuters review of Chinese state funding data. Argentina’s national newspaper Clarin reported at the weekend that if the deal was signed, China would loan Argentina $6.5 billion to be repaid in 20 years, with eight years of grace and a 4.5 percent annual interest. Reuters was not able to independently confirm these details. The message to Macri and other regional leaders is increasingly that “your sovereignty can be lost by being so ensnared in debt, you can lose your sovereignty to the person who holds your debt,” the U.S. official said. China’s foreign ministry strongly disputes that view. “China’s investment and financing in Latin America are in line with market rules and common international rules and practices, and do not have any political conditions attached,” the ministry said in a statement to Reuters. The involvement of Chinese companies in water, power and road projects has helped to drive Argentine economic and social development, it said. Defending Argentina’s relationship with China, an Argentine government official told Reuters that Beijing was an important investor and would only become more important in the future. However, the official acknowledged the U.S. concerns were not without merit. “Overall, I would say it’s a fair warning and it’s something countries should take into consideration. I think Argentina takes it into consideration very seriously,” the official said. China’s attraction to Argentina can be attributed to three factors: natural resources, weak institutions, and the country’s lack of other financing options, according to Juan Uriburu, an Argentine lawyer who has worked on two major Argentina-China joint ventures. “China can afford to have these competitive (interest) rates. In the meantime, what they create are new markets for Chinese companies abroad, which back home means Chinese companies will be working, making the products, making the locomotives, the cars, the rails, everything,” Uriburu said. Tripodi, the Argentine investment agency head, credited Macri’s more business-friendly policies for the uptick in Chinese investment. Interest from Chinese companies was growing “in an exponential way,” he said. As a presidential candidate, Macri pledged to recalibrate Argentina’s relationship with China. Under his predecessor, Cristina Fernandez, Argentina had changed the law to enable Chinese companies to skip the bidding process if they were financing projects, according to Margaret Myers, director of the China and Latin American program at Inter-American Dialogue. When Macri took office in late 2015, he vowed to review deals the Fernandez government had made with China. Atucha III, a railway project and two hydropower dams in Santa Cruz province, which her late husband had governed, were among projects thrown into limbo. Cross-cancellation clauses, however, have made it difficult for Macri to terminate the largest projects, said Uriburu. Macri has instead renegotiated some terms, including bringing down the loan amount for the hydro dams from $4.7 billion to $4 billion. In Brazil, Latin America’s biggest economy, right-wing President-elect Jair Bolsonaro also took a tough stance against China on the campaign trail, portraying it as a predator seeking to dominate key business sectors. But since winning election Bolsonaro has softened his position, saying China is welcome to invest in Brazil and that trade between the two countries could grow. China’s influence in Argentina extends beyond the numbers. For example, it has established Confucius institutes, cultural organizations, at Argentina’s largest university, the University of Buenos Aires, and a second college in Buenos Aires province. Some U.S. lawmakers have warned that the institutes, which number more than 100 around the world, are an attempt by China to further its political influence, which Beijing denies. In one of the most visible examples of Chinese soft power in Argentina, the government held a nationally televised event with the Chinese ambassador earlier this month to showcase armored vehicles and other security equipment that China has donated to help secure the G20 event. Argentine security officials told Reuters they would hold a separate event to highlight U.S. aid for the summit, which begins on Friday. That has yet to happen.